The result of Daniel’s endeavours was THE DRAGON’S PATH [UK | US | ANZ] – the first book in The Dagger and the Coin series. It’s a novel that veers away from many of the stale tropes of the genre – there are no farmboys destined for greatness, no dark lords or flashy magic. 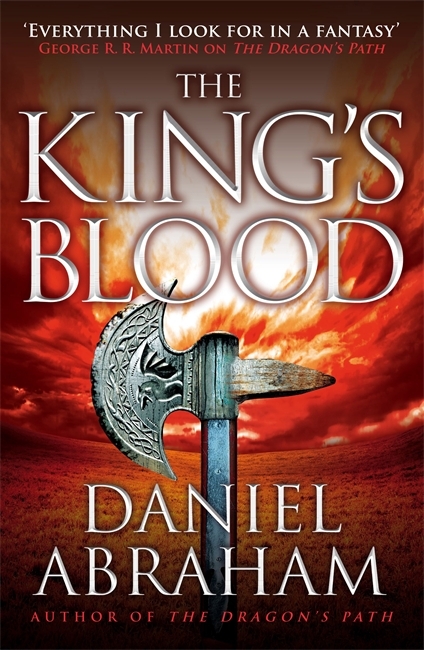 Yet at the same time it’s an epic fantasy in every sense of the term, full of deadly politics, battles and ancient secrets – all delivered with Daniel’s accomplished characterisation and subtle worldbuilding. The story that began in THE DRAGON’S PATH is now continued in THE KING’S BLOOD [UK | US | ANZ], out now in trade paperback – and the great news for fans is that you’ve seen nothing yet. In this second book of The Dagger and the Coin series, Daniel wastes no time in cranking up the tension and suspense. The result is an exciting, unpredictable tale of a kingdom in crisis. The power games still continue, but players who thought they were safe now find themselves in trouble. Enemies become friends and friends become enemies. Battles are fought, blood is spilled, and heads roll. Yet at the same time we’re allowed a deeper look at this fascinating world that Daniel has created: a world where the jade roads of the long-gone Dragon Empire still crisscross the land, where the thirteen races of humanity share a common history but remain divided, and where economics can be just as effective as warfare. A world where something that has been forgotten won’t remain hidden for much longer. As before, the critical reaction has been hugely positive. 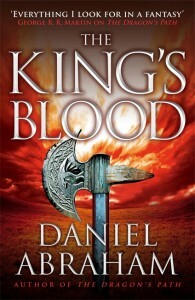 You can find an excerpt of THE KING’S BLOOD here. For a look behind the scenes at the cover design process – warning: involves an exciting amount of weaponry – check out our recent video. Daniel Abraham is the author of the critically-acclaimed Long Price Quartet. He also writes urban fantasy under the guise of M. L. N. Hanover, and is the James half of James S. A. Corey, author of the Hugo-nominated LEVIATHAN WAKES [UK | US | ANZ]. He can be found online both at his website and on Twitter.